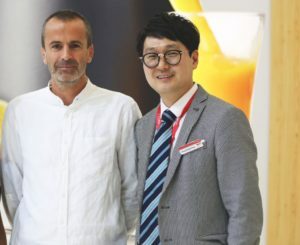 Kuvings, the South Korean technology company that specialises healthy eating appliances such as juicers and blenders, has appointed UK Juicers as sole distributor for the UK market. At the consumer electronics and home appliances trade show IFA 2018 (held from August 31 to September 5 in Berlin), Kuvings unveiled Motiv1. The product is billed as the world’s first juicer to incorporate IoT technology into thumb sensors which can accurately measure seven different body compositions. A mobile app then translates this data, enabling the juicer to prescribe tailor-made recipes. The app can also categorise recipes by different themes and align them with the user’s health goals. Earlier this year, Kuvings unveiled its flagship EVO820 model: a slow juicer with an 82mm feed chute, described as the largest available on the market. This juicer joined the SV500 Vacuum Blender, which launched with the world’s first noise reduction cover. To see the full range of Kuvings juicers available through UKJuicers.com, visit here.